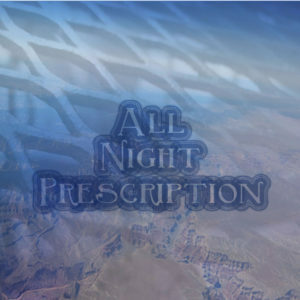 All Night Prescription is the musical collaboration of Daniel Lippincott and David Levy. Daniel, hailing from Oakland, met his Portland counterpart some 3 years gone by and after a brief visit to David’s studio to hear some musical ideas it was clear that a future lay waiting for these two musical prodigies. In their own ways representing a ‘left coast sound’ in the American musical landscape, these two bring together an vast array of influences which combine to form a truly unique yet very familiar sound. Daniel’s blues and rock background blends seamlessly with David’s deep knowledge of electronic and dance music. In fact, both of them share a love of DJing which was anther initial point of connection and this shared love of ‘beats’ shows up clearly in every song they produce. 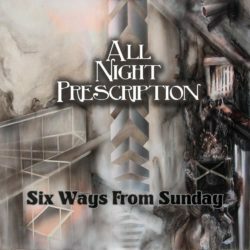 Truly a labor of love, “Six Ways from Sunday” took all of 3 years to complete and represents the possibilities of long-distance collaboration at its finest. Take a good listen to a new sound in modern music that will surely stand the test of time.